Every time you pass a test and complete a lesson successfully, you are awarded trophies. The higher your test score, the more trophies you collect, and the faster you can move up in our ranks. To keep you focused on your target, we have defined six ranks that approximately match the CEFR levels (A1 to C2). There are three membership levels: Bronze, Silver, and Gold. Each level provides access to certain resources. To facilitate your access to the resources that are not included in your chosen membership level, we have introduced a credit system. You can use your credits for downloads and one-to-one lessons, or you can use them to unlock some of the online resources. Every member receives 10 free credits when they first join. Silver members receive 60 free credits per month of membership (2 credits a day). Gold members receive 150 free credits per month of membership (5 credits a day). Every time you move up a rank, you receive a certain number of free credits. 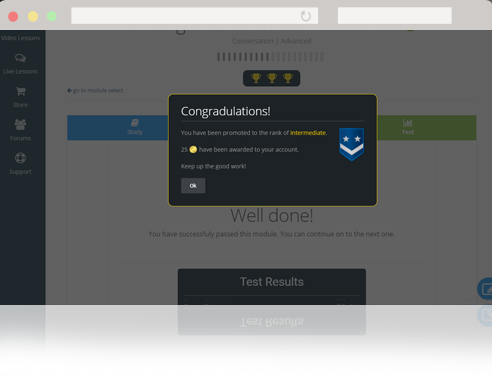 A member providing an 'excellent answer' (as selected by a teacher) to another member's question in the forums is awarded free credits too.